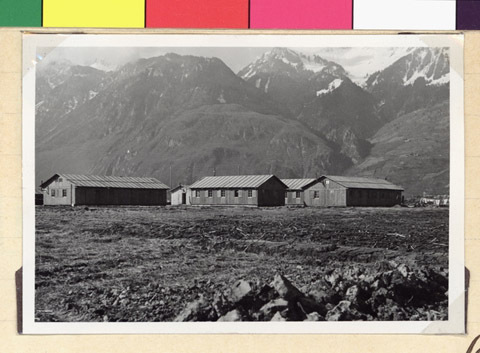 JDC - Archives : View of the wooden refugee shelters in a field with the Alps in the background. Title View of the wooden refugee shelters in a field with the Alps in the background. Description View of the wooden barracks for Jewish refugees in Swiss labor camps on the Valais side of the Rhone Valley. This is one of nine labor camps for refugees in Switzerland, which house 800 of the 6000 refugees in the country.